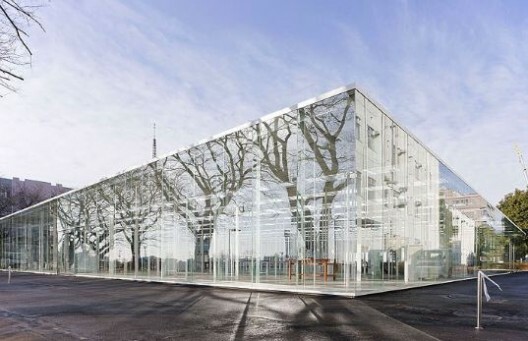 The Kanagawa Institute of Technology Workshop by Junya Ishigami is an elegant rectangular box with with floor-to-ceiling glass, enclosing an interesting interior space with 305 columns of various sizes supporting the stripped roof of skylights. The columns, although seemingly random, are specifically placed to create the sensation of zoned spaces, but their nonrestrictive quality provides a flexible layout to suit the changing needs of students. Now you can get a better sense of this space by using Google Streetview to navigate the interior, as seen on the above image (just drag it). For a larger view just follow this link. One of our favourite architects. But the center was looking much better without those posters or robots all over the place... And with flower or tree plants. Anyway, the "power user" (or rather the participant) is always right isn't it? 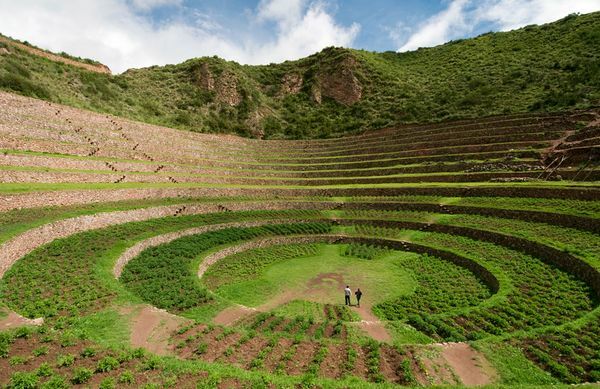 A slideshow over at National Geographic features this image by photographer Ian Wood, showing, in the magazine's own words, "what might be called extreme Inca landscaping." "Three enormous pits, each with beautifully curved sides that staircase down like the interiors of titanic flowerpots have been carved out of the earth to depths of up to 100 feet and more," the magazine adds. They are like Indian stepwells—only they concentrate thermal gradients—and this affects the local weather: "Air temperatures between the top and bottom layers can differ by more than 20 degrees, which has led some researchers to theorize that Moray was an Inca agricultural site where experiments on crops were conducted." It's a site of experimental agriculture fueled by an act of microclimatic terrain deformation. So does this mean that the weather at Moray should be subject not only to meteorological analysis, but to archaeological interpretation? The site you're excavating seamlessly continues into the sky above it, turning the weather itself into an historic artifact—a whole new spin on paleotempestology. 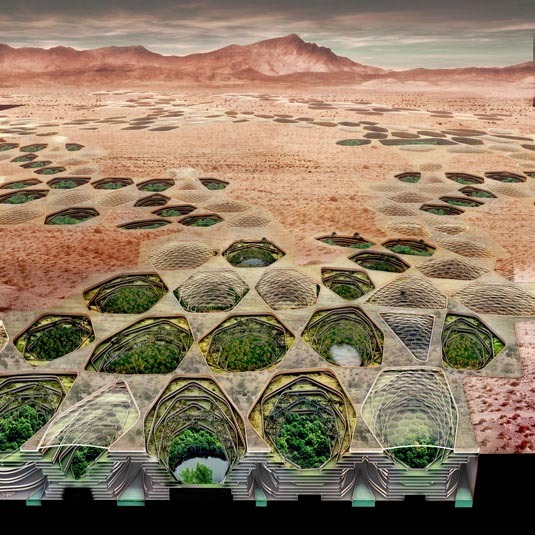 Superficially, I'm reminded of the hexagonal "water storage banks" of Sietch Nevada, a speculative design by the San Francisco-based firm MATSYS. While the resemblance doesn't go much beyond form, this comparison lets us borrow MATSYS's idea of a water bank and, thus, reinterpret the Incan site at Moray as a kind of weather bank, storing temperatures and headwinds year round. It is a space to store climates in. Extrapolating wildly from this, if the rise of the Himalayas radically altered the earth's climate by changing weather patterns for thousands of miles in all directions, then perhaps we can imagine a scenario in which a network of artificial pits in the Andes begins to affect the jet stream, plunging Australia into drought and pushing rain far north into Mexico—and that, in turns out, is those pits' very purpose, having been excavated by scientifically advanced, self-styled weather warriors more than 600 years ago for reasons still unclear today. Groups of elders would get together in the dark, sitting around their pits in tight circles as the winds picked up, burning incense, singing tales, hurling storms like artillery into the central Pacific. 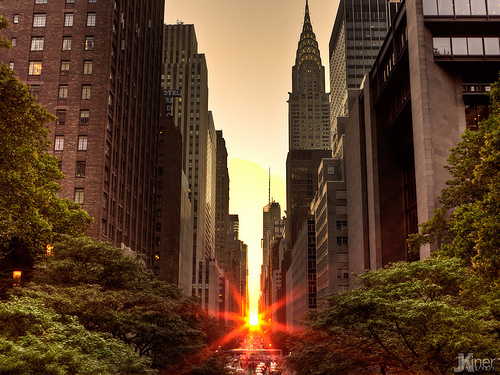 Manhattanhenge, is the term used to describe a biannual occurrence in New York City when the sun aligns with the east-west streets of Manhattan’s main grid. Adopted in 1811 the famous street grid of Manhattan, the Commissioners’ Plan, was the original design plan for the streets in which the grid plan is offset at 29.0 degrees from true east-west. 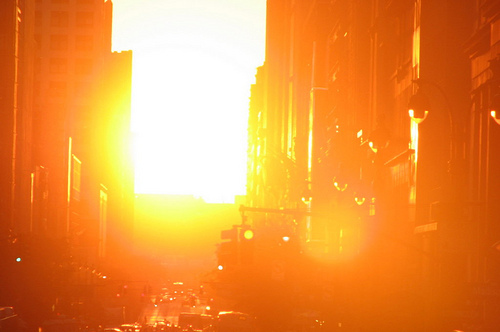 Twice a year photographers gather to witness this urban solar phenomenon, when the sun sets perfectly between the skyscraper corridors and illuminates the north-south facades of the streets. 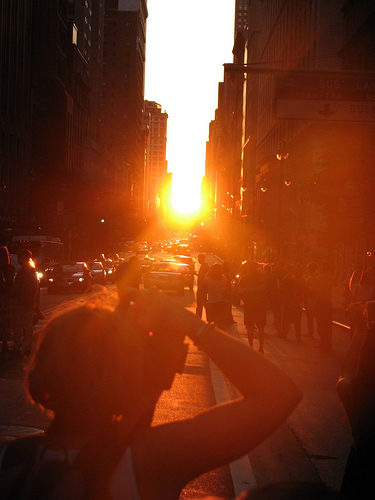 Tripods and pedestrians filled the crosswalks this past Wednesday to catch a glimpse of this moment. During the 1930′s, the United Kingdom wanted to reinforce its defense system against the growing antagonism that would end up in the Second World War. That is how they invented the RADAR (RAdio Detection And Ranging) but before such achievements, they experimented an architectural system on the Kent coast that would allow an early warning of potential enemy planes and bring an idea of their directions. Those monumental sound mirrors were reflecting sound into a microphone that was able to determine the direction of the enemy aircraft by determining which area has reflected sound the most. In order to know more about them -which were eventually gave up before the beginning of the Blitz- you can read the article Listening for the Enemy written by Solveig Grothe for German magazine Der Spiegle. 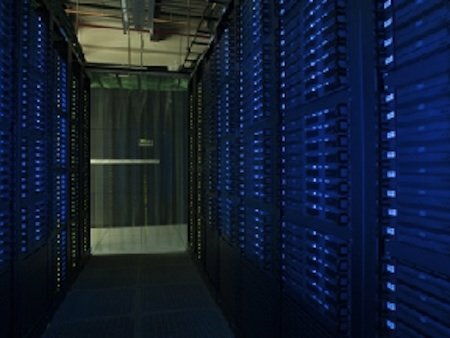 Built "architectures" to amplify and (in a way) deterritorialize sounds.